1. After the Referendum: What Path Forward for Iraq’s Kurds? 4. Why did Erdogan sacrifice Kurdish vote? 5. What is Trump’s policy toward the Kurds? Does he have one? 7. Kurds in Iraq: Back to square one? 9. Will Turkish-Iraqi alliance against Kurds hold? 12. 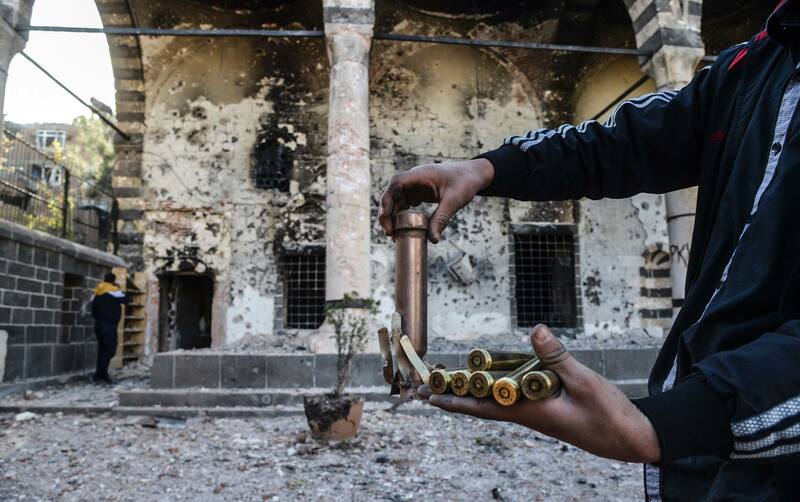 What Is Turkey Up to in Syria? Komalen Ciwan (Communities of Youth) and Komalen Jinen Ciwan (Communities of Young Women) launched a campaign named “Rise Up!” in order to raise awareness about the isolation on Kurdish leader Abdullah Ocalan and demand his freedom, resist against Turkish attacks on Rojava and invasion of Southern Kurdistan and celebrate 40th anniversary of PKK. The campaign will last until the Newroz, March 21, of 2018. Iraqi Kurdish leader Masoud Barzani’s announcement he plans to step down was greeted with jubilation in Turkey’s pro-government media. Turkish President Recep Tayyip Erdogan accused Barzani, his once close ally, of betrayal for his decision to hold a September independence referendum. Barzani failed Kurdish people and should withdraw from presidency Shasuwar Abdulvahid Qadir, the leader of New Generation Movement said. Qadir also voiced criticism about the proposal to postpone the elections for one year and called to hold the elections on time to form a new government in Kurdistan region. Oil exports resumed from Iraq’s Kurdish region after halting earlier Monday, a port agent said, highlighting uncertainty about pipeline shipments from OPEC’s second-biggest producer. (…) The halt came days after Iraqi troops captured oil fields from Kurdish fighters in northern Iraq’s disputed Kirkuk province. Iran will reopen all its border crossings with Iraq’s Kurdistan region in the coming days, lifting restrictions imposed after last month’s Kurdish vote in favor of independence, its chief of staff said on Monday. Ankara and Moscow continued their coordination on Syria ahead of the seventh round of peace talks in Astana on Monday. Ankara MP Önder, who is also a member of the HDP’s Imrali Committee, chair of the Parliamentary group and Istanbul MP Pervin Buldan and Urfa MP Dilek Öcalan organized a press conference in the Turkish parliament to address Öcalan’s health and security conditions. With hundreds of participants calling for an urgent meeting with Kurdish People’s Leader Abdullah Öcalan, the sit-in in front of the CPT building is continuing. Representatives of many movements, institutions and parties from Turkey are expressing their support. 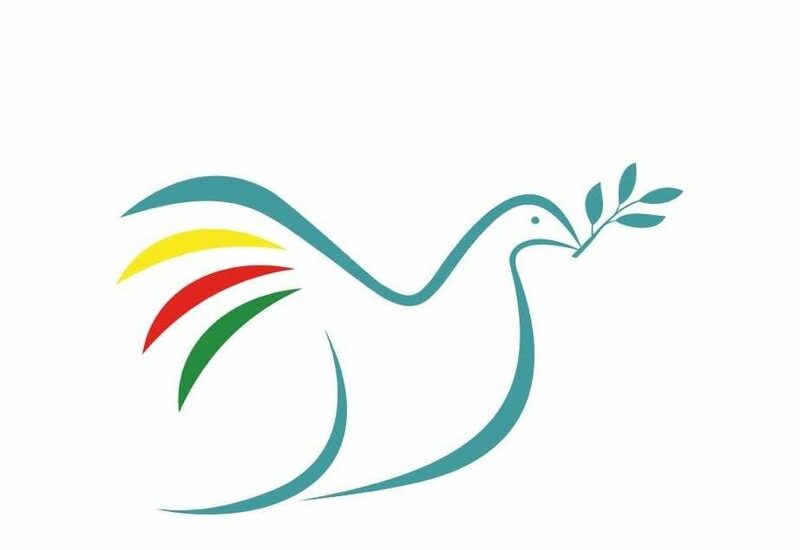 International İmralı Peace Delegation wrote a letter to CPT officials requesting an urgent meeting on the situation of Kurdish People’s Leader Abdullah Öcalan after reports spread on social media in Turkey regarding his health. Michael Enright, a YPG fighter from Manchester, has been fighting in the ranks of Syrian Defence Forces against ISIS in the ‘great Battle’ to liberate Raqqa. The first thing Enright did in ISIS’ so-called capital after the historic defeat of ISIS was to rush to the main square of the city and play an Ariana Grande song on his mobile phone to honour the victims of Manchester bombing, in which ISIS killed 22 teenagers and wounded 112 as result of an attack at Ariana Grande’s concert on May 22, 2017. ISIS gangs besieged by Syrian Democratic Forces (SDF) in the Operation Cizire Storm are attacking the SDF positions in an effort to break the siege around them near Deir ez-Zor. The crisis unfolding around the Iraqi city of Kirkuk has left some of the world’s largest commodity trading houses worried the country’s autonomous Kurdish region will struggle to repay billions of dollars in cash-for-oil loans. Kurdish officials said on Thursday thousands of their people had fled Kirkuk region fearing persecution since Iraqi armed forces retook it following a referendum on Kurdish independence that was rejected by Baghdad. The officials said roughly 100,000 people had gone, though that number could not be confirmed independently, and many Kurdish neighborhoods in Kirkuk city appeared to be operating normally. Eleven activists have gone on trial for terror offenses in Turkey — including two local Amnesty International chiefs and two foreigners — as the country continues with a purge that has gutted institutions in all areas of public life. Turkey has detained tens of thousands of people, including journalists, activists and opposition political figures, following an attempted military coup last year. Turkey’s farmers, livestock producers and their related unions are emerging as a new and unexpected mass opposition in the country, staging rallies and marches to protest sustained heavy economic losses. Despite all their efforts to soothe the anger of Turkey’s rural population, President Recep Tayyip Erdogan and his government continue to grapple with this surprising opposition. The September 25 referendum in Iraqi Kurdistan brought a chilling reaction from Iraq’s central government. Baghdad disputed the legitimacy of the process, but especially rejected Erbil’s claim on Kirkuk and other disputed territories implied by staging the vote there. Following days of military action that resulted in deaths and the retaking of Kirkuk by Iraqi national forces, the KRG has proposed to freeze the referendum results and seeks negotiations about the contentious issues. The United States, which opposed the referendum despite its reliance on Kurdish fighters combating ISIS, must now address the deepened rift between Erbil and Baghdad. Turkey enjoyed the influence it wielded in Iraq because of its ties with the Kurdistan Regional Government, but it would rather see the KRG fall than risk an independent Iraqi Kurdistan inspiring Turkey’s Kurds to seek the same. The Iraqi Kurdistan independence referendum continues to make waves in Syria as the country’s Kurds believe they can negotiate with the Syrian government to establish a federal state. Turkish President Recep Tayyip Erdogan, having lost his last Kurdish “brother” Massoud Barzani, explores other ways to compensate for the Kurdish vote. The Kirkuk crisis seems largely over. With the exception of a pocket here or there, Iraq has regained areas lost or abandoned in 2014, while the Kurdistan Regional Government (KRG) retains control of those regions which the Iraqi constitution assigns it. The Kurdistan independence referendum backfired and Kurds are suffering, but Turkey might want to hold off on celebrating until it considers the long-term consequences. The U.S. nearly brokered a deal last weekend to avert the current crisis over the disputed city of Kirkuk, where Iraqi forces and some Iranian-supported militias displaced Kurdish fighters this week. It has been widely reported that Iraqi security forces entered Kirkuk and a nearby military base and oil fields because of a deal made by the relatives of the late Jalal Talabani, the former Iraqi president and Kurdish revolutionary who died this month. Ankara is happy that the Baghdad government has regained control over Kirkuk, but questions remain whether Turkey and Iraq can agree on the city’s future status. Around 8 p.m. on Oct. 15, an Iranian general from the powerful Islamic Revolutionary Guard Corps (IRGC) accompanied by Iraqi Commanders Abu Mahdi al-Muhandis and Hadi al-Ameri sat down with the Kurdish commanders in Kirkuk. The IRGC commander, known only by his surname, Eqbalpour, who works closely with Quds Force chief Qasem Soleimani, told the Kurds to give up the city peacefully. “If you resist, we will crush you and you will lose everything,” the general warned the peshmerga commanders, a source with intimate knowledge of the meeting told Al-Monitor. Turkey is expanding its latest military intervention in Syria rapidly, sending more special forces and commandos into Idlib as part of a high-risk effort agreed to with Moscow and Tehran to establish a de-escalation zone in the northwest Syrian province that is mainly controlled by an al-Qaida offshoot. Following the coup d’etat in July 2016 attributed to Fethullah Gülen, the Turkish government had cleansed its university libraries. Notably, it had ordered the destruction of 1 800 000 copies of different manuals (including mathematics) published by publishing houses linked to the preacher or simply bearing his initials. TOMORROW, the 25th Huseyin Celebi literary festival — organised by the Kurdistan Students’ Union (YXK) in Europe — takes place in London. It will be the first time that the festival has taken place outside of Germany and is held in the memory of British-Kurdish film-maker and journalist Mehmet Aksoy, who was killed by Isis fighters in northern Syria last month. The five years preceding the 1978 founding congress of the Kurdistan Workers’ Party (Partîya Karkêren Kurdistan, PKK) are referred to by its members as the party’s “existential period”. In the PKK’s “existential period” public spaces, such as university dormitories and canteens and student associations played an important role as meeting places, yet political formation occurred mainly in private spaces, especially private apartments and houses. On 25th September 2017, the eligible voters of the Kurdistan Region of Iraq were given the opportunity to respond ‘yes’ or ‘no’ to the question, posed in Kurdish, Turkmen, Arabic and Assyrian: “Do you want the Kurdistan Region and the Kurdistani areas outside the administration of the Region to become an independent state?” The aim of this note is to give an empirically focussed account of the independence referendum. The note has been written by four members of a delegation who spent one week in the Kurdistan Region of Iraq (KRI) with the purpose of observing the referendum. The key point that we draw from these observations is that the referendum and the associated aspiration for independence, which potentially could have unified the different political factions in the KRI, has in fact cruelly exposed divisions. We call for the representation of the Democratic Federation of Northern Syria (previously Rojava) on the Geneva Peace talks. The seventh round of the Geneva Peace talks on Syria concluded in July 2017 without a resolution. This is partly due to the obduracy of Assad’s envoys who are reluctant to discuss a transitional political process and partly the inefficacy of the UN. On World Kobane Day, 1st November, the British government has the opportunity to demonstrate support for rebuilding peace and strengthening popular democracy for the men and women of the middle East who have fought bravely to successfully resist the encroachment of ISIS, whose aggression and politics has been viewed as a threat to all humanity. The demonstrations held in Switzerland to demand freedom for Kurdish People’s Leader Abdullah Öcalan continue with different methods. 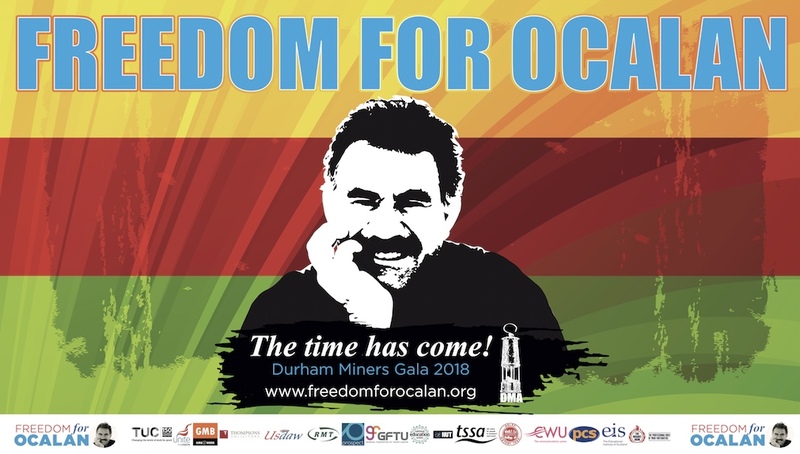 Giant billboards in the Solothurn central train station are displaying posters demanding freedom for Öcalan. The posters say “Freiheit für Öcalan” [Freedom for Öcalan] and have photographs of him, and they will be on display for a week in the train station with heavy foot traffic. Environmental and heritage destruction has accelerated in Turkey’s historic city of Hasankeyf as crews work day and night, seven days a week to collapse vulnerable portions of the cliffs ringing the town and fill in some 200 caves. The work’s stated aim is to reinforce Hasankeyf’s ancient citadel ahead of completion of the Ilısu Dam, which would flood most of the town beneath approximately 60 meters of water. Over these five days at P21 Gallery, while our partners Theatre for Everybody present their stage adaptation of Tolstoy’s War and Peace to hundreds of people in Gaza, flanked by artwork from Gaza artists, there will be a series of events at which teachers, psychotherapists, paramedics, community activists, artists, theatre makers, public health experts/environmentalists, Shakespeare students, mothers here in the UK and in Gaza will have conversations and share experiences. We will also link up to activists in Gaza and Rojava, Northern Syria. These conversations will be filmed and this film will present a portrait of the community in Gaza as it is drawn by these diverse communities of interest. Patrons: John Austin, Christine Blower, NUT International Secretary, Prof Bill Bowring, Julie Christie, Noam Chomsky, Jeremy Corbyn MP, Prof Mary Davis, Lord Dholakia, Simon Dubbins, UNITE International Director, Jill Evans MEP, Lindsey German, Convenor STWC, Melanie Gingell, Rahila Gupta, Nick Hildyard, Dafydd Iwan, Former President Plaid Cymru, James Kelman, Bruce Kent, Jean Lambert MEP, Elfyn Llwyd, Mike Mansfield QC, Doug Nicholls, General Secretary, GFTU, Dr. Jessica Ayesha Northey, International Coordinator, Green Party of England and Wales;; Sinn Fein MLA Conor Murphy, Dr Thomas Jeffrey Miley, Kate Osamor MP, Margaret Owen OBE, Gareth Peirce, Maxine Peake, Lord Rea, Joe Ryan, Stephen Smellie, Dr Tove Skutnabb-Kangas, Dr Tom Wakeford, Dr Derek Wall, Julie Ward MEP, Hywel Williams MP.